I’m having a great February, how about you? 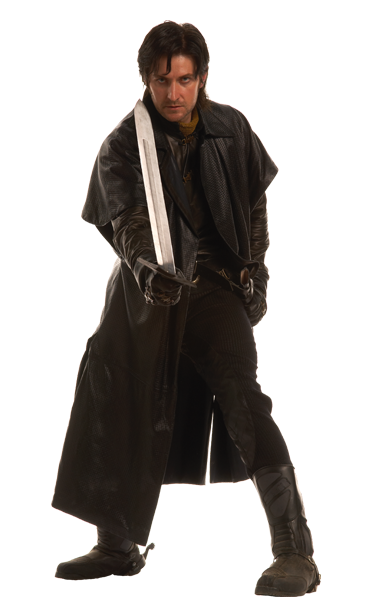 By now you may have already seen the newly discovered promo pictures of Richard Armitage as Guy of Gisborne at RichardArmitageNet.Com. Big thanks to Ali for finding these high quality images! Did you notice how similar that image is to Little Guy? I don’t have a Little Guy action figure, so I found a picture online and made the following siggie. I was so enchanted by that promo picture that I immediately set out to make a wallpaper. 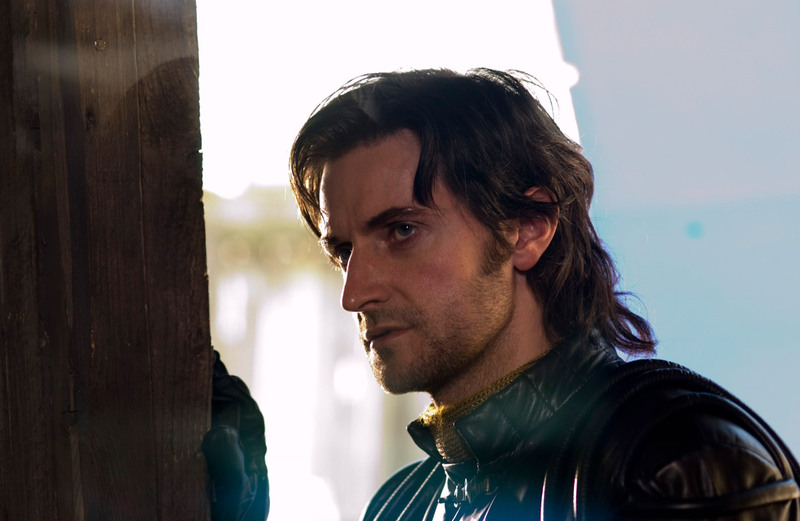 This is my very first Guy of Gisborne wallpaper! The dimensions are 1600 x 900 pixels. Please click for full size. The text “Sir Guy” is written in Springtime Capitals typeface. The font for the quote “Knight of the Kingdom of Dreams” is Spirit Medium. I borrowed the quote from Mark Twain’s book, The Prince and the Pauper. As mentioned on RichardArmitageNet.Com, the original source of these high-quality images is a German television site, http://robinhood.superrtl.de/, if you would like to explore there. There are two more new Guy promo pictures, one of which happens to be the Picture of the Day at RichardArmitageNet.Com if you want to check that out! See you tomorrow when we pick up the February animation challenge where we left off. 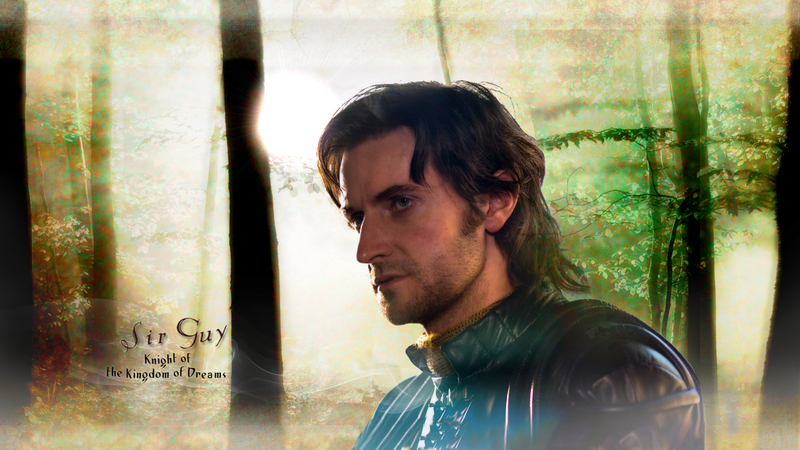 This entry was posted in Graphics, richard armitage and tagged actor, graphics, guy of gisborne, richard armitage, richardarmitagenet, richardarmitagenet.com, richardarmitagenetdotcom, robin hood. Bookmark the permalink. I love your tutorials and the wallpaper is gorgeous! May I use it on a board ? Ooops, it’s siggie in English, not “ban”. @April: Yes, I’d be honored if you used my siggie! I hope you enjoy it! Thanks for your lovely comment. I forgot about the little Guy action figure! A bit alike I do agree… Lol. @phylly3: Alas, I don’t have any pictures. They are all on my friends’ cameras. BCC, the wallpaper is dreamful. 5″ Little Guys are lovely! Who will win the fight? These new pics inspired you a lot! Congratulations BCC… you gave new life to the picture!!! The wallpaper is wonderful!!! By the way, the quote fits perfectly!!! I like the Guy vs Guy Banner and the Sir Guy. Thank you for sharing!!!!! @Jael: The two graphics are quite opposite and I’m delighted you enjoyed them both! 🙂 Thanks for your comment! No wonder you are having a great February- who wouldn’t sitting and fiddling with those pics- especially that you know what you’re doing 🙂 Awesome! @IWantToBeAPinUp: It’s pure pleasure to work with such beautiful images! 😀 Thanks for your kind comment! @Angela: You are not alone! The Guy with the sheriff picture is the favorite of many. 🙂 This picture with Guy’s profile really provoked a response in me! Everything goes better with some Miles. These are great! Fantastic, bccmee!!! Love the siggie and the wallpaper is gorgeous!!! Agree! John Standring is so charming…more of him would be nice. I’m with you! @Dhana: Oh my, that would be fabulous if some John Standring promo pictures ever emerged! Oh yes! That would be very exciting! I’m not sure which operating system you use, but when I want to use several wallpapers, I set them up with the “slideshow” setting in Windows 7. Slideshow on Win7 sounds good. I must give it a try. Thank you, bccmee. OMG I haden’t seen yet these new pictures whereas I go on RA.net every day!!! It was an emergency to show us this little treasure , you have been right. New pics of Guy , I didn’t expected it! I love the siggie and the wallpaper! Thank you so much Bccmee! @Lady Prisca: I happened to be on twitter when the new promo pictures were announced. 🙂 I didn’t expect such a great find either! I’m happy for any little bit of newness that can be found right now! The pic used for the sig make me think about Star Wars. Guy could be a Jedi! @Lady Prisca: LOL! You’re so right about that pose! Wonderful pics – love the Guy v Guy banner. And as for the wallpaper …. Im using it already!! My fav is the POD picture! @jacqui_coinyard: Maybe I should’ve had a poll, LOL! I agree. That POD pic is HOT! I love the Guy wallpaper! Awesome job! It may or may not be my new desktop wallpaper. Also, I am off work today and I may or may not get anything done because I keep getting distracted by my beautiful desktop background. He looks so amazing in profile! Thank you, Bccmee! These images are wonderful. Love the wallpaper!! @Leigh: They are such beautiful promo pictures and I’m so happy they have been discovered. 😀 Thanks for your comment! Made a few changes is this one better? It looks hot and dreamy! 🙂 I would love to visit your blog….! Thank you, thank you! I love the wallpaper! LOL, he looks just like Little Guy! Love the siggie! So nice to have something new of our Guy! @Carolyn: Oh I am just so thrilled to see some new images of Richard Armitage. ♥ Even though I’m in the minority, I like Season 1 Guy best of all, so I feel particularly fortunate. Thanks so much for your supportive comment! I’m in the minority also, Bcc Mee! Love S1 Guy best, scarf, sniffs, smirks and all! @Carolyn: Yay! S1 Lovers Unite! @Joanna: Speaking of speechless, when I finished the wallpaper, it was devoid of any text. When I found that quote though, I felt it would add to the image. @jeanniegisborne: That’s a great slogan! Too bad you weren’t working for the BBC when Robin Hood was airing, LOL! @Ania: Aw that’s so sweet that you’re using this wallpaper already. 🙂 Haha, I know how hard it is to make graphics when I’m looking at Guy’s beautiful countenance. I think the two Guys will fight to the death for the posable horse, LOL… Love the wallpaper. You took a great photo and made beautiful artwork. I love Sir Guy in any season, but my personal favorites to watch are the various interviews, he fascinates the hell out of me, he seems like a different person each time. @Patty Craig: ROTFL! I’m guessing you are referring to that sweet, funny and charming BBC America interview with RA. ♥ *sigh* Yes, I also love watching his video interviews so much! Your gorgeous wallpaper is on my desktop now. Thanks so much! The Little Guy look-alike sig is funny!l The new pic of Guy holding his sword like a baseball bat may inspire you to make another funny something? Love the newly uncovered promo shots and your wonderful wallpaper creation! I miss seeing and listening to Richard. I wish he would give some an interview and do a photo shoot now and then, but I know he must be super busy with The Hobbit movie. So, I thank you so much for these old, but made new, images of Sir Guy! Have you ever considered becoming a therapist? You’ve made many people extremely happy today:) MWAH!!! @Mersguy: Isn’t it amazing? All these years later and we still find new gems from time to time. 🙂 Here’s hoping for more past pictures in the future! I’m pleased to say that I have a Little Guy and his horse Richie, sitting beside my monitor. The photo of Big Guy looks like Little Guy right down to the hair. @NancyMae: Woohoo! I love seeing Richard Armitage characters on horseback. How fun that you have a Little Guy and his horse. They are quite the collector’s items now!